A weekend flash mob robbery at a Germantown, Md., 7-Eleven prompted the Montgomery County police chief to call again for a teen curfew. At least two dozen teens and young adults were caught on surveillance video Saturday grabbing items from store shelves and walking out without paying. The clerk said he felt helpless against them. “They basically took over that store for the minute they were in there,” Chief Thomas Manger said. Some suspects have been identified, and each is a juvenile. 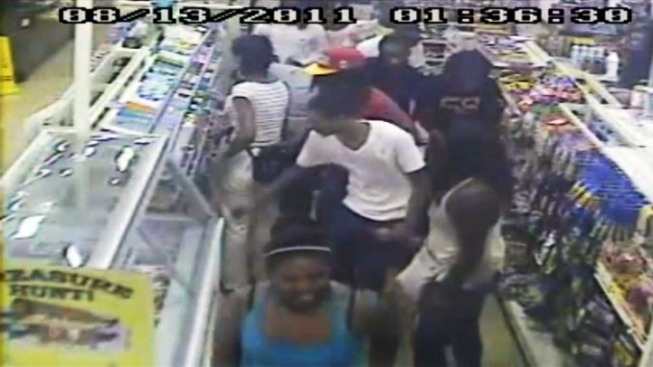 Darcy Spencer reports on a convenience store robbery disguised as a flash mob in Germantown. “If we had a curfew law in effect, this incident could have been prevented,” Manger said. Last month, the Montgomery County Council proposed a curfew that would require children under the age of 18 to be home by 11 p.m. on weeknights and midnight on weekends. It would operate like laws already enforced in D.C. and Prince George’s County. “If a police officer sees 30 kids walking down the sidewalk and they all look pretty young – and these kids were young – we go out and say, ‘How old are you? You’re 17. You need to go home,’” Manger said. A county council committee will review the proposed curfew in September. Meanwhile, police and the state’s attorney are deciding what to do with the flash mob robbery suspects they apprehend.